NEW YORK -- A packed Long Island Rail Road rush-hour train crashed at the end of a platform as it pulled into a major Brooklyn transportation hub on Wednesday, hurling passengers onto the floor and slamming them into each other. 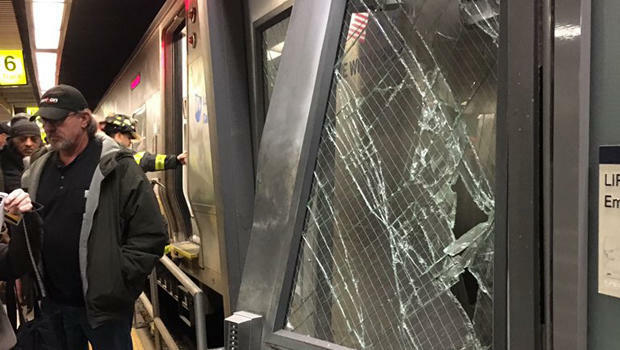 The front of the slow-moving train hit a bumping block as it pulled into Atlantic Terminal, left the tracks and smashed into a small structure, apparently a work area; a rail pierced the floor of a train car, authorities said. About 100 people were treated for minor injuries after the 8:30 a.m. crash; many had been standing as they prepared to get off the train at the last stop. Another passenger who said he was in the train’s first car told the station that the train seemed to be running at its usual speed before it suddenly jolted. Some people were removed on stretchers. Others sat, stunned, on the pavement outside - bleeding, holding ice packs on their heads, rising and limping away with help from rescuers. The most serious injury, though, appeared to be a broken leg, said Mayor Bill de Blasio. “Luckily ... all things considered, this was a relatively minor accident,” said Gov. Andrew Cuomo. The terminal is beneath a shopping mall in downtown Brooklyn, adjacent to the Barclays Center, home to Nets basketball, Islanders hockey and major concerts. A similar accident across the harbor in Hoboken, New Jersey, in September was much worse. There, a New Jersey Transit commuter train plowed off the end of a track, killing a woman standing in the station. Federal investigators are examining whether a more modern bumper or other barriers could have made a difference. The train in Wednesday’s wreck originated in the Far Rockaway section of Queens and was carrying around 450 people, officials said. “I sort of slammed into the folks who were facing me,” said Audrey Foster, who was sitting in the second car and hurt her side. Foster said there were a lot of familiar faces on her daily commute, and many of those people were injured. “It’s just sad,” she said. The National Transportation Safety Board dispatched investigators. Prendergast told reporters that he didn’t expect the incident to affect the evening commute.